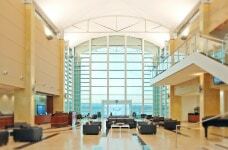 Luxivair SBD, Southern California’s Premier FBO, was categorized as an “FBO of Distinction” by AC-U-KWIK last month. The FBO was listed for its convenient location situated within very easy reach of Los Angeles and Palm Springs, and for its incomparable service and sophisticated facilities catering to business and leisure travelers, pilots, crew, and their aircraft. International passengers and flight crews should consider Luxivair SBD for their next entry into Southern California. The FBO, located at San Bernardino International Airport (SBD), offers access to southern California through uncongested airspace. Upon arrival, passengers experience Luxivair SBD’s five-star amenities while crews have access to first-class flight planning and rest areas. Conference facilities with full catering can be arranged for customers who wish to conduct business while at this FBO. Luxivair SBD had a full range of aircraft services available at competitive prices, professional ground support staff, and on-site MRO facilities to provide aircraft repairs and custom performance upgrades.